The Cardinals against Clayton Kershaw — again. The Cardinals trailing the Dodgers in the seventh inning — again — with Kershaw dominating — again. Matt Holliday leading off the seventh with a single off Kershaw, followed by Jhonny Peralta singling — again. A big hit by a Matt to stun Kershaw and the Dodgers and give the Cardinals the lead — again. In Game Four, however, it was Adams instead of Carpenter — and he launched a no-doubt-about-it-even-Joe-Buck-got-crazy-excited-3-run-bomb into the Cards bullpen (which of course you want to see again and again even though you’re already watched it countless times). In the ninth inning, Trevor Rosenthal in for the save and makes it interesting — again. Yet that’s a winner — again! And a win that’s a division series clincher — again, like in 2013. And 2012. And 2011. So it’s back to the National League Championship Series — again (and again and again). A one-in-two chance of winning the National League pennant — again. Facing the Giants in the NLCS — again. 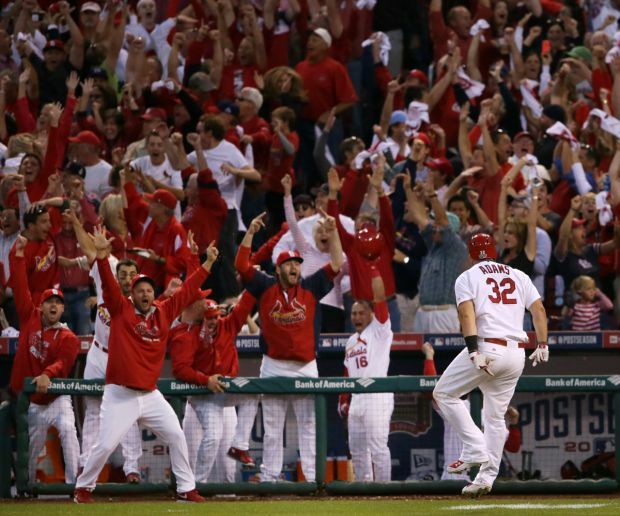 And would we as Cardinals fans want it any other way — again? This entry was posted in 2014 Cardinals and tagged 2014 postseason, Clayton Kershaw, Jhonny Peralta, Los Angeles Dodgers, Matt Adams, Matt Holliday, Trevor Rosenthal by Christine Coleman. Bookmark the permalink.